Yes. Our centre has been through the accreditation process three times. Every time we have achieved the highest possible accolade of "high quality centre". We find the accreditation process is a lot of work but very rewarding. Is there a planned program and a daily routine? Yes. We program annually as a whole centre, annually for each rooms yearly goals, and weekly in each room, which is based on individual child observations and developmental needs. Each room has a daily routine, which is on display in the room, along with the weekly program. We also do a school readiness program for the older children. Our centre supplies hats, sunscreen, fruit, drinks, morning tea, lunch, afternoon tea and all other needs such as tissues. Children still in nappies are required to bring their own nappies and wipes. Children should dress in play clothes and bring a change in case of an accident or weather changes. We provide all other needs. All meals are made fresh daily from the freshest ingredients available. We have fresh fruit, biscuits, and breads. We have sandwiches made from bread baked the same day. Fillings are nutritious and include salad, egg, cheese, meats, and a variety of spreads. Staff are diligent to cultural and religious influences on children's food choices. We provide generous quantities of food for all our children and ensure that meal times are a pleasant environment, which provides for positive social interaction. 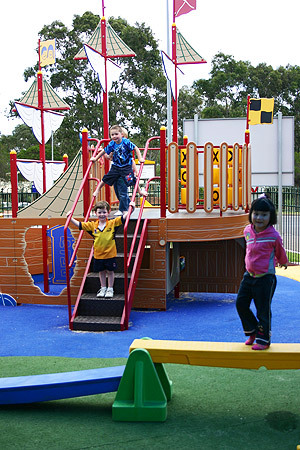 We use equipment of the highest standards, check the playground and buildings daily before children arrive, and all buildings and equipment are kept in a safe working condition. All staff are trained in first aid. All staff are aware of any custody issues, and follow proper procedures. Our centre is secure from strangers, and staff do not allow access to persons not known to them. The safety of our children is a huge priority at our centre. Can we be involved at our child's centre? Yes. Parent involvement is encouraged and appreciated. We encourage input through newsletters and notice boards as well. We often hold parent information evenings and social events. We welcome families ideas and suggestions as we wish to continually improve our service to you. Children's ideas are also implemented.